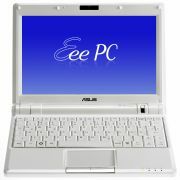 Posted on April 19, 2008 by D.C.
Crave is reporting that the 9-inch Asus Eee PC 900 will be available in the United States (and presumably Canada) on May 12, 2008. It’ll retail starting at $549 (for comparison, the 7-inch Asus Eee PC initially launched for around $150 less). Even though this netbook/laptop starts out at a higher price point, you are getting a larger display (resolution: 1024×600), in addition to more starting memory (1GB as opposed to 512MB), and much larger amount of storage (Windows XP: 12GB, Linux: 20GB). As you can see there is a larger hard drive for the Linux-version, at the same price point – the 8GB difference in the solid state drive (SSD) is offset by the higher cost of the Microsoft license for XP. This entry was posted in Announcements, ASUS, Netbook, Solid State Drives. Bookmark the permalink.